2018 Iowa Employer Benefits Study© is Now Available! 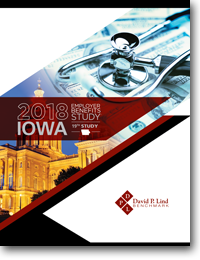 The 2018 Iowa Employer Benefits Study© overall summary is now available! As we have done with recent studies, we are providing this summary report through an electronic download only, rather than a printed hard copy. As mentioned in a previous blog, we had 1,001 Iowa organizations participate in this year’s survey, reaching our goal of 1,000 respondents. In addition to the standard benefit questions presented each year, we asked organizations to share data on paid time off (PTO) and traditional leave components, highly popular benefits that are valued by employees. If your organization participated in this year’s survey, we sincerely thank you for sharing your data with us and for your patience while the report was being published. We realize that many employers wish to use the results of this important Study during the fall enrollment process. On August 28, participants in this Study were sent an email from us with a unique link to gain access to this report (at no cost). If you have any questions, please don’t hesitate to contact us. Again, we greatly appreciate your interest in this 19th study! To stay abreast of employee benefits, we invite you to subscribe to our blog.